A club “Volcano” is another example of the well-promoted brand. The casino has been existing for several years. For this time it has already managed to gain a reputation as a dubious gambling joint. Users complain about a bad return and unqualified support. 4.2. How can I complain about the casino? 5. Is club “Volcano” a scam? As a potential client of this casino, you’d like to know whether it’s really a scam or just a victim of unfair competition. Let’s find it out. The Volcano club showed up in 2014. The name of the owner of the platform is carefully hidden. The support staff members tell that it’s done for “for security reasons”. After the ban on online casinos in 2009 in Russia (with the exception of specially designated gambling zones), many resources appeared, most of which don’t have an official license, even abroad. That’s the fact the employees of the Vulkan club refer to, adding that competitors might copy their official information. According to the online information, the casino owner is Fornus Ltd., which is registered at Edwin Wallace Rey Drive, 201 Rogers Office, George Hill, Anguilla. However, it’s quite difficult to confirm it because this company is absent in the registry. The platform supports only one language – Russian, and only one type of currency – the Russian ruble. In this case, the conversion is made through the US dollar, and a commission is charged for it. All transactions, as the operator claims, are conducted via a secure SSL protocol and in accordance with the international Payment Card Industry Data Security Standard (PCI DSS). The safety of the casino resources is provided by McAfee Secure anti-virus system. The provider uses mirrors to protect the resource from Roskomnadzor blocking. It also offers clients to download and install the Easynet plugin. There is a mobile version in addition to an installation file for downloading to a personal computer. The official website of the club is decorated with the traditional blue and red tones. The design emulates the style of a nightclub: the logo in the neon backlight, bright advertising, popping-up tips and a large amount of information bombarding the user from all sides. The game collection includes more than 200 titles. Slots prevail (they make up more than 90% of the entire collection), but there are also table games (poker, baccarat, blackjack), as well as several types of roulette. In the club “Volcano” you can play for money or in the demo mode: almost every game has its demo version. The lobby is divided into categories: “Popular”, “New”, “Exclusive”. “Slots”, “Tables”, “Favorites”. Separately, special entertainment is provided. For example, these are “The strip game” and jackpot. The footer is loaded with very different information: a pile of advertising texts, a link to the license (which actually leads to a regular HTML page created by the operator), agreements, FAQ, and sections duplicating the main menu. In addition, there are payment services used on the side and contact information. To communicate with representatives of the casino, you can use an online chat and a feedback form. The club doesn’t have an official mobile application. It has only a version of the side adapted for mobile devices (smartphones, tablets). It just has another layout, including the location of the game table and the menu. At the bottom there are “Promotions”, “Search” and “Help,” while all other sections are hidden in the Mobile section. Advertising is collected in one slider and does not interfere anywhere else. The game collection of the mobile version includes 200+ products with the ability to try games in the demo mode. The bonus program, the choice of currency, as well as the deposit and withdrawal methods, are the same as in the widescreen version. The speed of loading pages is quite fast, which causes some surprise because the site is just another mirror. 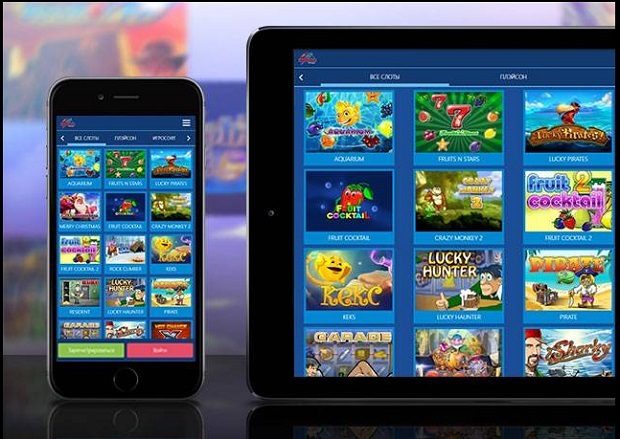 The club “Volcano” gives an opportunity to download the casino platform in the offline format to a personal computer or tablet. The requirements for the download version: Windows operating system not lower than Windows 7 or Mac OS. The download takes several minutes and, as stated by the operator, it doesn’t require the installation of additional components/drivers. Exclusive bonuses provided only to owners of the offline application. If you already have an account in the club “Volcano”, you can log in to the game from your computer with the same login and password, which you registered in the browser. If not, you can pass the initial registration. Unfortunately, the live-collection is absent in this casino. The “Tables” section includes roulette, poker, blackjack, and baccarat in the video format. The club “Volcano” exists for a long time, so the lack of these products can’t be attributed to its youth. In addition, live products bring the bulk of industry revenue: the stakes are higher, the customers are more serious, and the gaming session is longer. One can only guess why the provider has neglected such a serious source of income. The Vulkan Club cooperates with several game makers: Novomatic, Igrosoft, EvoPlay, Playtech, Casino Technology, Belatra, US Production, Unicum. All these are well-known developers with a good reputation in the iGambling industry. The only question is whether this software is licensed or “scripted” (self-made). This can be determined only by confirming or denying that the operator has a license. Via social networks Vkontakte, Odnoklassniki, Facebook, Twitter – in this case, it will be necessary to grant the service access to information on your personal page. 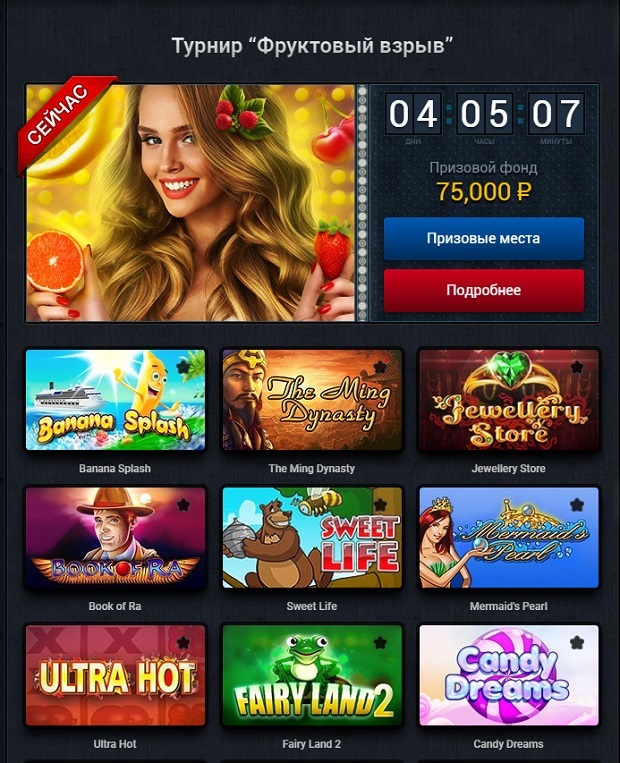 The personal account includes your profile data (your status in the loyalty program (we will tell about it), contact details and a confirmation button), awards (“Frequenter” for visiting the casino every day during the week, “Champion” for receiving a prize in the tournament and etc. ), bonuses and an exchanger (we will mention about it in the “Bonus Program” section). At the top of the screen, the current balance is displayed with a deposit button. Unlike the game lobby, the custom menu looks less confusing. The casino bonus program is tied to the player activity. The club “Volcano” doesn’t give away promotional codes in the network, and in general, there aren’t any promotions that don’t require any action from users. On the other hand, the casino offers a rich loyalty program (for those who make a lot of bets), quests, lotteries, and tournaments. Even the achievements in the personal account, which we discussed above, are directly related to the actions on the site or in the application. Something similar can be found in emulators: when you get an achievement, you earn one or another bonus (in this case, you can get money on your account or free spins). The casino doesn’t give its customers an opportunity to receive no deposit bonuses. Instead, the club “Volcano” focuses on another category of the promo. In general, this action is rarely found in modern casinos, as it implies the possibility of fraud (when the user simply receives funds and tries to withdraw them, even without wagering them). Of course, there are rules that can protect the operator, but the human factor still matters. The starter pack provided by the Vulkan Club is also quite poor. The deposit bonus is only 15% of cash back. 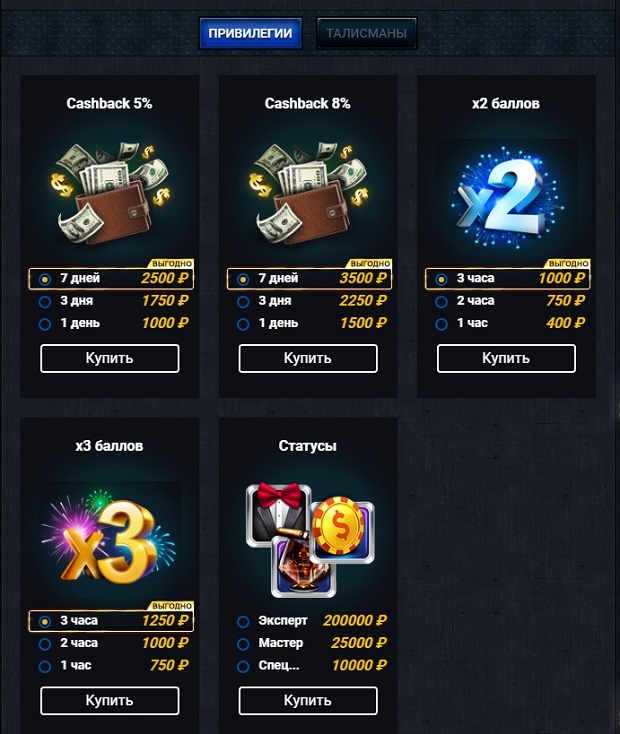 To get this bonus, you need to deposit at least 1000 rubles. A wager for wagering the bonus funds is x30. Daily quests: a series of tasks (for example, to make 500 spins for at least 45RUB each). 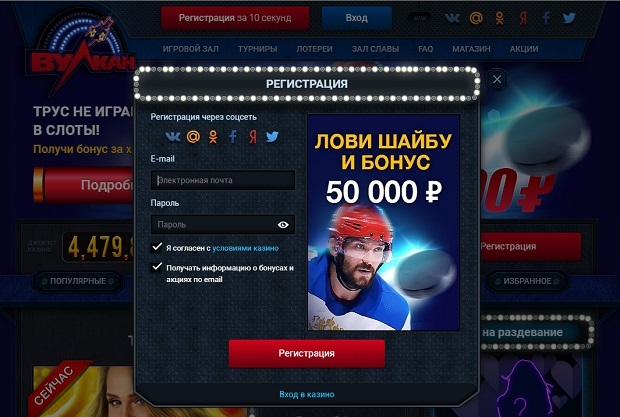 The prize for the series reaches 15000RUB. Additionally, prizes are awarded for each task. When you skip a single task, the series is considered lost. A wager for cash prizes is x15. Weekly quests: the execution of tasks for a time (a timer is working). A wager for prizes is x15. “The Wheel of Fortune” – a bonus mini-game. Prizes: bonus points, currency, additional multipliers (for example, double points). 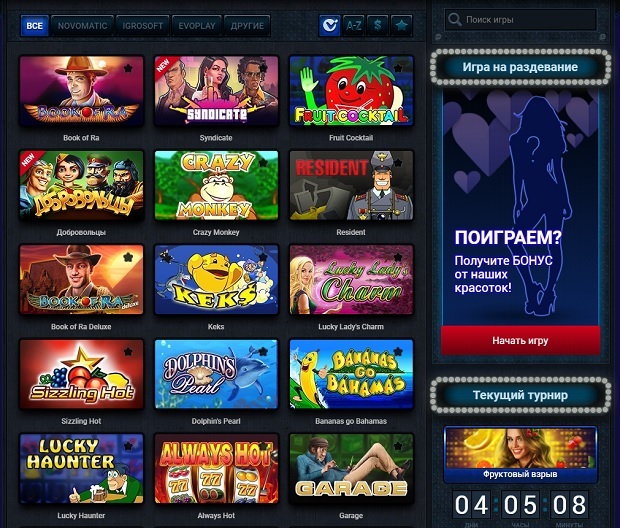 Spins: paid (300RUB) and free (when depositing an account for 3 days in a row for 500RUB or more). For all prizes, you require an x20 wager. Tournaments are varied in this casino. The event table includes at least one weekly competition. To take a place in the ranking, players need to earn as much tournament points as possible (they are awarded for bets). The club “Volcano” offers a variety of lotteries with a prize fund of up to 2000000RUB. Lottery tickets are purchased for bonus points, which are given for every 170RUB wagering on slot machines. If you want to get more points, the operator offers to purchase a doubling or tripling in the store (it also has other privileges). In addition, statuses give all sorts of privileges: cash back, doubling or tripling of points, access to VIP events, free spins on the Wheel of Fortune, etc. 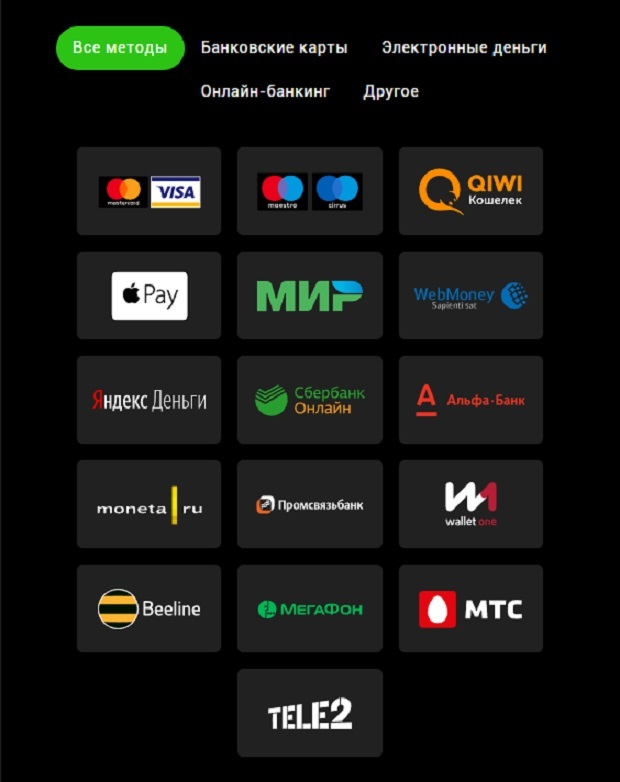 To deposit their account, Vulkan club players can use any bank card (VISA, MasterCard, Maestro, Mir), SMS payment, online banking (Alfa Bank, Sberbank. Online, Promsvyazbank) and several types of electronic payment systems (Russian and international). The funds will be written off in the US dollar equivalent, and then re-converted into Russian rubles, so you should not be surprised if the amount of the transaction will be higher than initially planned. This is due to the fact that the operator is abroad and all operations are executed through a foreign bank. The minimum deposit is 500 rubles. You can only withdraw money that has been wagered (it means that bonus funds don’t count). The list of services for receiving payments is much smaller: there is only VISA/ MasterCard., Moneta.ru, Yandex.Money, Promsvyazbank, and Alfa Bank. For one transaction, you can transfer no more than 150000 rubles. If your winnings are larger, it will be split into several parts. In addition, there are minimum withdrawal limits: for e-wallets, it’s 100 rubles, for bank cards – 3000. After receiving your withdrawal request, the site administration may request documents proving your identity for the safety of your funds. We have carefully studied the reviews published in the network, and we can say that the club “Volcano” has a bad reputation among the players. We found no information about the availability of a license for the club. The support staff also failed to give us the answer, allegedly for security reasons: to prevent this information from falling into the hands of fraudsters who can simply publish it on their own resources. The club “Volcano” contains a section “License”, but it leads to the usual HTML-page that web designer can create. We also could not find official data on Fornus Ltd in the registries of jurisdiction regulators. All this leads us to the inevitable conclusion: this gambling joint doesn’t have a license to carry out gambling activities. 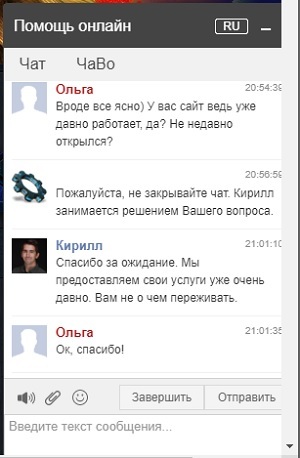 “Money from the account disappears” – first of all, it occurs due to faults (the player is “thrown out” from the account, and having re-entered, he does not see his entire deposit; we have counted several similar reviews). How can I complain about the casino? If you’re faced with violations by the casino, you should contact the customer service of the club “Volcano”. The best way to do this is to contact them by e-mail. 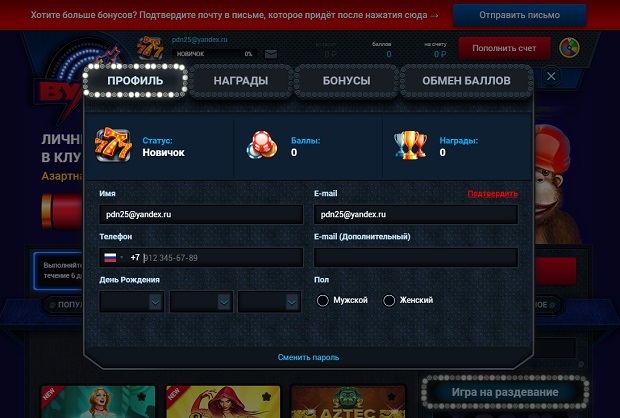 The operator has created a separate mailbox for receiving complaints: complains@club-vulkan.com. The remaining methods of influence will be useless since neither the license number nor the institution regulator is known. In addition, in the operator’s Terms and Conditions, there is a clause that removes responsibility for most violations, failures, and mistakes (we will consider this condition in the appropriate section of our review). Given the fact that the club does not have an official supervisory body, you will have to rely only on the humanity of their support staff. The casino support is accessible 24/7. Communication with the service is carried out via online chat, e-mail (a direct letter or request in the form of feedback) and by phone +7 (499) 346-39-39 (it’s free for Moscow, other regions pay for the call at the rate of their operator). The response is not always fast. In particular, several times contacting an online consultant, we faced different waiting times – from one to 7 minutes. In the case, when the manager does not respond within 3 minutes, you will receive an automatic notification asking you to wait. The answers of the employees are not always completely true and can back the interests of the club (which is logical). For example, we know that the casino was created in 2014 – that is recent. However, the representative of the casino, responding to our question, whether the resource has been open for a long time, answers that it was opened many years ago. Of course, this may seem like a misunderstanding, however, knowing the context, we come to the conclusion: the manager tries to mislead so that the player wouldn’t be afraid to invest. “Terms and Conditions” is the name of the agreement regulating the relationship between the club “Vulcano” and its clients. The document was drafted in such a way as to minimize possible losses on the part of the gambling joint under any circumstances. Let’s examine several points that demonstrate this. One of the necessary conditions for the use of resources of any casino is the confirmation of identity. Administration of the club “Volcano” notifies that it has the right to verify the data you entered at any time. In addition to complying with the security rules, this condition has another side: if your provider does not like your activity (for example, you start to win), it can come up with a check. All transactions for this period will be limited. If any discrepancies are discovered, the account will be simply blocked (of course, without returning your money). That’s what the users of the thematic forums told. This point removes responsibility from the provider for any of your losses. It would seem that we are talking only about losses incurred as a result of the receipt of your personal data by third parties (your login and password). However, to prove that you were robbed not because you were careless but because of the service provider’s fault is almost impossible. Thus, making any claims against the club “Volcano” is useless. In the event that the amount of payment that you request isn’t at least twice the amount of the bets, the operator will take a fee of 10% for the service. This means that you need to have your bets double wagered if you don’t want to lose your personal funds (after all, the amount of bets is written off from them first, and then, if they are not, from bonus credits). Any suspicious actions on your part can result in account blocking if the administration decides that you are violating the rules/law. However, there are reasons to call the player a scam: the presence of a fraudulent strategy, collusion, etc. Unfortunately, unfair resources often use this approach. That’s another condition that removes the club responsibility for the loss of customer funds. 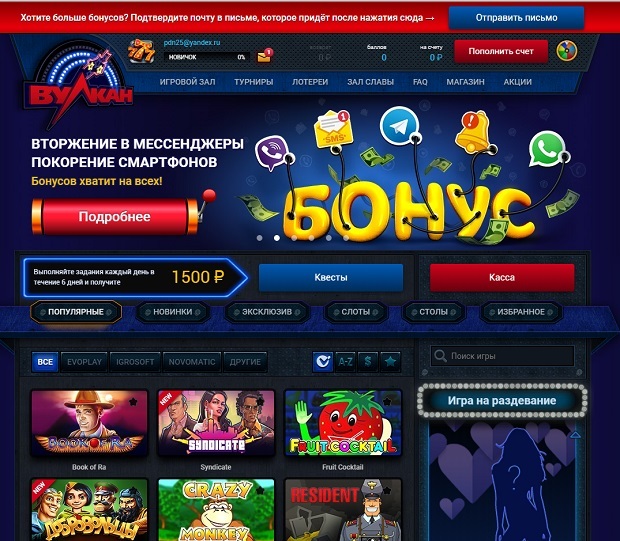 Similar situations were also mentioned among the reviews of the club “Volcano”: the player was raising the bets, and then lost money as a result of a “technical failure”. Of course, there are similar clauses in the agreements of any casino, but everywhere they are used differently. Even if you contact the administration of the service with a complaint, the Terms and Conditions have a clause that won’t allow you to achieve the desired result. “Discrepancies between the results of the game on the player’s computer and the results on the server” are a good reason to prove the illegality of the user claim. Is club “Volcano” a scam? The club “Volcano” has disappointed us with its attitude to users. The terms and conditions have clauses that violate the players’ right to fair play. Official information about the license, the regulator and even jurisdiction is absent. The only advantage that we found was the presence of a well-made mobile version of the site and a download PC version. 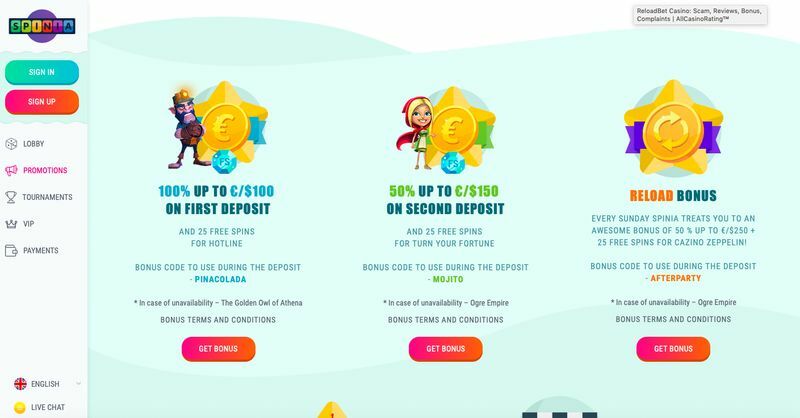 The collection of games of this casino isn’t rich, while the bonus program, although diverse, is aimed primarily at depositing the user account, and wagering conditions are tough. In general, all the information we have found leads us to the conclusion that the club “Volcano” is a scam aimed at obtaining funds from the largest number of clients. The club “Volcano” has turned out to be another fake stuff of the iGambling industry. The casino doesn’t keep promises given to its users. As for its functional and software, it can’t compete with European products. However, for the last four years, the operator has developed an offline PC version and adapted the site for mobile devices. Just for this, we have added a few points to this assessment. In all other respects, that’s just a parody of that “Volcano,” which existed in the early 2000s.